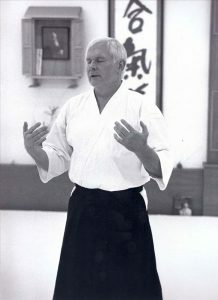 John Stevens Sensei was recently interviewed on bodedit.com where he speaks candidly about his recovery from cancer, how his Aikido training helped him through this process, and how the spiritual nature of Aikido has helped him move from towards the light in the face of adversity. “One reason we train is to meet the challenges in life. And those include, getting old, getting sick and dying and being separated from the ones you love- those are the hardest things we encounter. I have experienced all those things, except dying. Yet, we have to learn to accept and adapt to any challenge. I’ve been sick now for four years and it’s been very difficult. But, Aikido has taught me to learn to accept any challenge, deal with it head- on, and not being discouraged, but optimistic.